The Saas and Zermatt regions of the Swiss Valais, combined with the adjacent Monte Rosa massif, have the greatest concentration of 4000m peaks in the Alps. With proper acclimatization and mountaineering training many of these can be ascended without encountering great technical difficulty; others present great challenges for experienced mountaineers. In the surroundings of these great peaks the potential for traditional mountaineering is immense, and routes for alpine climbers at all levels are possible; from climbing your first 4000m-summit to climbing the big mountain of your dreams after years of training. Below are two recommended programs based on many years of memorable mountaineering adventures as well as up-to-date local knowledge to give you the best over-all experience. 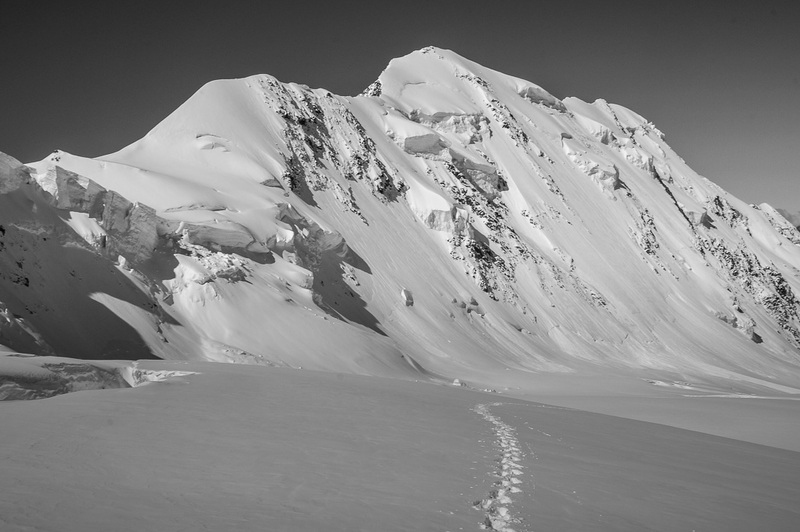 An week of high alpine mountaineering in the Eastern Pennine Alps. In 5 days we climb 3 of the 4000m summits surrounding the beautiful villages of Saas Fees and Saas Grund. The Saas valley rests between two groups of great 4000m peaks; the Mischabel group and the Weissmiess group. Cable cars aid the access to get off the valley floor on both sides. 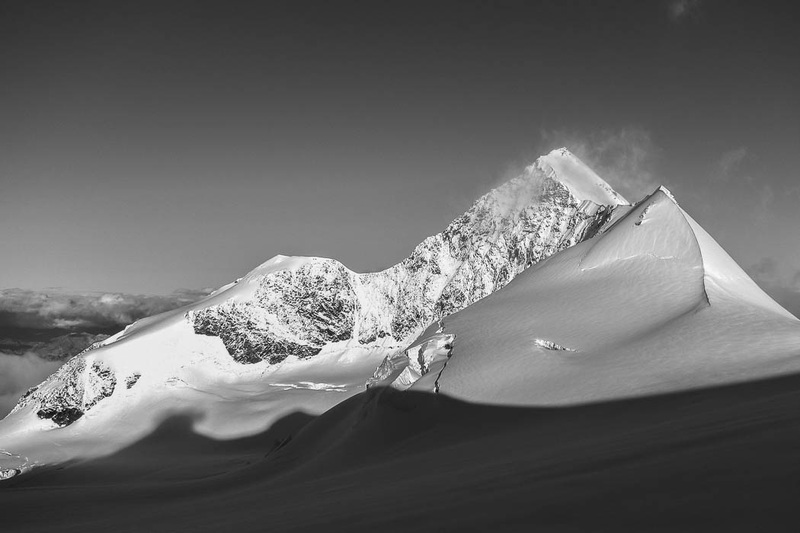 Climbing these peaks is a varied mountaineering experience, with views across to Mont Blanc, the Monta Rosa massif and the Bernese Oberland including the Eiger and Jungfrau. The below program is a suggestion, but have you already climbed in the Saas area we can also choose other peaks or routes. It is worthwhile coming back to this place to climb the more advanced routes and peaks as well. Day 1: Meeting in Saas Grund, ascend to Almagellerhutte. Possibly a rock climb on Dri Hörnli in the afternoon. Day 3: Access by cable car to climb Allalinhorn 4027m or Lagginhorn 4010m, night in Saas Grund. Day 4: Ascent to Michabelhutte. – Accommodation in Chamonix, but we are happy to organize it for you. Ability: Confident mountain walkers with a good level of fitness to allow climbs of 5-9 hours per day in altitude. All the required alpine mountaineering skills will be taught at the beginning of the week. For more for experienced alpine climbers, we can choose different peaks, or climb the same summits by other ridges than their normal routes. Possible climbs are for example Nadelgrat, Strahlhorn and Lagginhorn. If you are completely new to mountaineering you might also consider our Alpine Climbing Intro Course, a 5-day Mont Blanc Course, a few extra days of Mountaineering in Chamonix or the Monte Rosa 4000m challenge. This week we have the opportunity to climb one of the famous, technical 4000m peaks that is the dream of many mountaineers. 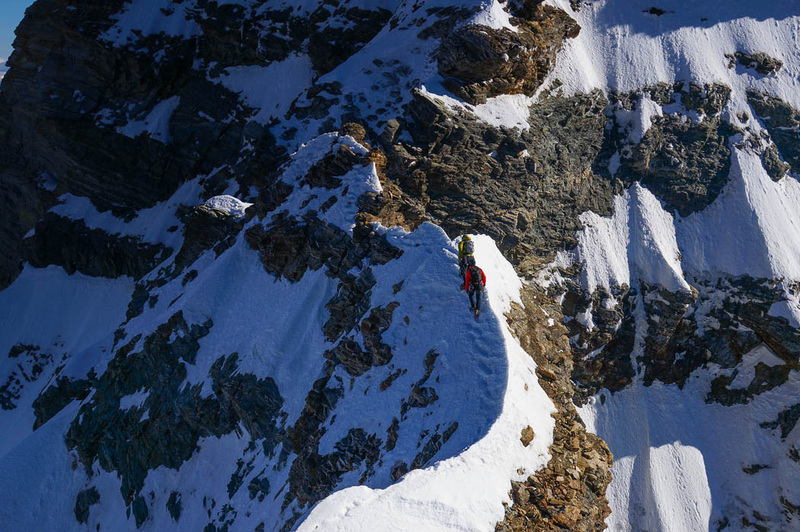 This will be a test of skills and strength for experienced mountaineers against the harder summits of the alps. We start with two days of preparation climbs in Chamonix then we move on to Zermatt from where we climb our bigger objective. Possible peaks are: Eiger, Liskamm, Zinalrothorn, Obergabelhorn, Dent Blanche or Schreckhorn. See special program to climb Matterhorn. Day 1: Acclimatization peak in Chamonix, for ex Traverse of Aiguille d’Entrève. Sleep in Torino Hut. Review rope mangement, belaying, knots and climbing techniques. Day 2: Climb Dent du Geant. Continue to review techniques, belaying, rappelling and down climbing. Sleep in Chamonix. Day 3-5: Drive to Zermatt and climb our selected technical 4000m peak. – Good level of fitness to allow 8-12 hours of technical climbing. – Good mountaineering experience and competent in using ice axe and crampons. – Able to climb grade 4 (French rock grade) quickly and confidently. – Mastering basic rope work techniques, rappelling and belaying. To acquire all the required skills consider our introduction and advanced alpine climbing courses. Price: Depending on the number of persons booking. Please contact us for a quote. – Guiding: Max 2 clients per guide during the preperation days and 1:1 client/guide ratio during the ascent of the technical 4000m peak. – All valley transports in Chamonix, the transport to Zermatt and back to Chamonix. – All necessary group equipment gear (ropes, karabiners). More reading about previous mountaineering adventures in the Valais region, guest testimonials, and other useful information in the Mountaineering blog category.